The December 1986 issue of Flood Hazard News featured an article describing the flood detection network and warning plan for Lena Gulch which had just completed its first full season of operation. 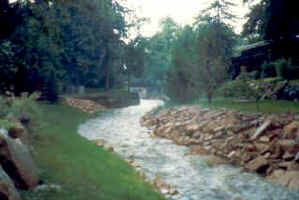 The primary emphasis of the 1986 article entitled: "Flash Flood Warning for Lena Gulch," was the installation and operation of the automated rain and stream gage "ALERT" network. This flood detection network was modeled after a similar system which has been operating in the Boulder Creek basin since 1979. The article described, in some detail, the components which make up the detection network; discussed meteorological support requirements and real-time applications; and identified the critical elements of the flood warning plan. In the article's closing statements it was noted that since the project was implemented, Lena Gulch had not experienced an emergency situation and that no significant rainfall had occurred. By the end of the 1987 flood season it had become clear that installing rain and stream gages would not prove to be an effective means of discouraging rain from falling as it had seemed in 1986. This article presents the Lena Gulch flood events of 1987 and reviews the detection and evaluation, the warning dissemination and the emergency responses which resulted. The Lena Gulch drainage basin is located in central Jefferson County and drains approximately 13.8 square miles at its confluence with Clear Creek near Kipling Street. The Lena Gulch headwaters are located in the Apex Gulch area of Lookout Mountain. Apex Gulch and Jackson Gulch join to form Lena Gulch just below Heritage Square near the intersection of U.S. Highway 40 and State Highway 93. Numerous developed areas downstream from this point are considered highly flood prone. Lena Gulch flooding will impact numerous major highways and arterial streets in addition to developed areas within unincorporated Jefferson County and the Cities of Golden, Lakewood and Wheat Ridge. One major water supply reservoir (Maple Grove Reservoir), which is owned and operated by The Consolidated Mutual Water Company, is located in the lower portion of the watershed (drainage area = 10 sq. mi.). The dam and reservoir are located near West 27th Avenue and Youngfield Street in Lakewood. Improvements to the dam and spillway were completed in 1977 to comply with the dam safety requirements of the State Engineer. These improvements included the installation of two Fabridams on the spillway crest which are operated in a manner to protect the dam from failure in the event of floods exceeding the 100-year magnitude. The Urban Drainage and Flood Control District (UDFCD) participated in the construction of one of these Fabridams as part of a major channel improvement project through the City of Wheat Ridge. The downstream flood control improvements, totaling more than $5,000,000 in construction costs, rely heavily on the flood control benefit provided by Maple Grove Reservoir. Should automatic or inadvertent Fabridam deflation occur in a severe emergency, discharges well in excess of downstream channel capacity can be expected with the loss-of-life potential being extremely high. The flood detection network for Lena Gulch consists of nine automated gages (6-rain and 3-stream) and two "ALERT" base stations. Figure 1 is a computerized map showing the Lena Gulch rain gage network and total rainfall amounts for the 1987 flood season (April 15 through Sept. 15). The remainder of this article describes the key flooding events which took place in 1987, and the operational activities which occurred. May 2-3 Jeffco Fairgrounds 1.26" 1.5 days 0.12"
May 19 Maple Grove Reservoir 1.20" 3.5 hours 0.20"
June 8 Jeffco Fairgrounds 2.24" 2 hours 0.78"
June 18 Maple Grove Reservoir 1.26" 30 minutes 0.98"
June 29 Jeffco Fairgrounds 2.02" 12 hours 0.24"
This heavy rainfall event occurred during the evening hours between 8:00 and 10:30 PM. This storm caused the most severe flooding of the 1987 flood season. Significant flooding was reported within Lakewood, Golden and unincorporated Jefferson County. Heavy damages to residential property were reported immediately upstream of the West 20th Avenue crossing of Lena Gulch and a portion of West 20th Avenue was washed out forcing a street closure. The Consolidated Mutual Water Company played a key role in responding to this emergency situation by sending spotters with radios into the upper basin to monitor upstream flooding and by assisting Lakewood Police with the closure of West 20th Avenue. Consolidated also maintained close contact with the Wheat Ridge Police Department concerning the status of Maple Grove Reservoir with respect to projected spillway flows and Fabridam operations. Other flooding occurred within the upper portion of the basin forcing evacuations at two trailer courts. A third trailer court was impacted at 13th Avenue and Isabell Street near Camp George West where street overtopping occurred. The Golden and Pleasant View Fire Departments responded to these problem areas after being notified by the Jefferson County Sheriff's Department. Serious street flooding was also reported at a number of other locations. The improved channel and in-stream detention facilities at the Denver West Office Park appeared to have functioned properly during the event. Other than normal clean-up activities, no other damages were reported at Denver West. Downstream of Denver West, between Arbutus and Youngfield Streets, no major damages were reported. UDFCD channel maintenance efforts over the past few years were credited at minimizing damages within this reach. The channel through this reach has been estimated to have a 10-year capacity due to rehabilitative maintenance projects completed by the District. The event of June 8 was estimated to have a return period of approximately 5-years. No damages were sustained downstream of Maple Grove Reservoir. Only minor spillway flows were recorded. With the exception of a trace of rainfall which occurred at approximately 7:00 PM, the beginning time of the storm was 8:05 PM with the first significant amounts of rain being reported by the Maple Grove gage. Pre-determined alarm levels (0.5"/hr.) were exceeded * at approximately 8:30 PM at Maple Grove. At that time, only a trace of rain had been reported from the Denver West gage and the upper basin gages had not reported any rainfall. By 9:00 PM the rainfall had ceased at the Maple Grove gage and radar showed the storm moving to the southwest into the upper basin. This was confirmed by rain gage reports. At 9:10 PM the rainfall intensity began increasing in the upper basin with 0.72" of rain falling within the next 20 minutes at the CDOH gage near the intersection * of U.S. Highways 6 and 40. From 9:30 PM on, all gages were reporting rainfall. Peak intensities occurred at the Jefferson County Fairgrounds and at Denver West at 10:00 and 10:15 PM respectively. The maximum peak intensity reported by the flood detection network was at the Denver West gage where 0.75" fell within a 15 minute period between 10:05 and 10:20 PM. The storm appeared to have ended by 10:40 PM with the last traces of rain reporting in by 10:55 PM. Serious flooding was being reported in the upper portion of the basin by 10:30 PM forcing trailer court evacuations. A peak discharge of 700 cfs was reported by the Nolte gage between Youngfield Street and West 20th Avenue at 11:00 PM (See hydrograph plot). The level of Maple Grove Reservoir peaked shortly after midnight. The flooding caused the reservoir to rise 2.1-feet resulting in a water surface 2.5-feet above the normal operating level (See stage-time plot). Spillway flows were estimated to be between 50 and 60 cfs. The peak 2-hour rainfall intensity of 2.04" was reported by the fairgrounds gage. This 2-hour amount corresponds to a precipitation frequency somewhat greater than a 10-year event according to NOAA Atlas data. The peak 5-,10-,15-,30- and 60-minute intensities were estimated to have return periods of 3- to 6-years. The peak inflow to Maple Grove Reservoir (700 cfs at the Nolte gage) was approximately 40 percent of the 10-year flood estimated for the 1975 Lena Gulch Master Plan. The flood frequency for the main stem of Lena Gulch downstream of Denver West was estimated to be a 5-year event. Prior to the evening event, meteorological forecasts were made of the flooding potential for that day. At 9:42 AM, Henz Kelly and Associates (HKA), private meteorological service under contract to the District, notified UDFCD of the potential for "Messages" to be issued later in the day. At approximately 2:20 PM, internal alert messages (MESSAGE 1, TYPE 2s) were issued for all District counties effective from 4:00 PM through 11:00 PM. These messages warned of the potential for flash flooding of intersections, low-lying areas and small streams. The forecast called for peak rainfall intensities of 1.5" in 30 minutes with total 3-hour rainfall amounts of 1.0" to 2.5" possible. Pea-sized hail was also forecast. An "Update Message" was issued to Jefferson County at 8:42 PM notifying them that Lena Gulch may be affected. Numerous other exchanges occurred between the various emergency response groups during the event. The storm was also being monitored by the National Weather Service (NWS) but was determined to not be of a magnitude to warrant issuing a Flash Flood Watch or Warning. NWS criteria is based upon regional responsibility for monitoring weather for the entire Front Range of Colorado. The Denver Weather Service Forecast Office (WSFO) is located at Stapleton International Airport. At 1:03 PM, three hours prior to rainfall, UDFCD received an electronic mail message from HKA indicating that "MESSAGE 1, TYPE 2s" were issued for all District counties calling for fast moving thunderstorms capable of producing 1- to 2-inches of rain in 30-minutes. The valid time for Jefferson County was from 1:30 to 9:00 PM. District staff assistance was requested by HKA to assist with Lena Gulch flood forecasting. The event of June 29 is recognized as the largest upslope rainfall of the 1987 flood season. This event was carefully monitored with the primary concern being the high level of Maple Grove Reservoir as a result of a very wet month. Should a thunderstorm have moved into the basin, significant spillway flows could have been expected and upstream flooding would likely have been worse than that experienced on June 8. The major portion of the rainfall fell within a 12-hour period with slightly more than 2-inches reporting in from the fairgrounds gage. A peak discharge of approximately 210 cfs was reported by the Nolte gage at 1:03 PM. Discharges in excess of 100 cfs continued to flow into Maple Grove Reservoir for a 9.5--hour period between 12:10 and 9:40 PM. 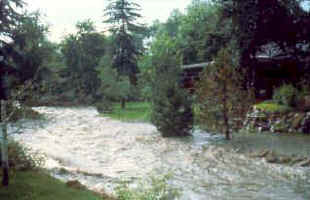 The storm events of June 8 and June 18, 1987, illustrate how rapid runoff occurs from small urban watersheds like Lena Gulch. These events also illustrate the importance of accurate meteorological forecasting well in advance of rainfall. Short duration intense rain storms, such as the June 8 event, are difficult to forecast, particularly where the scale of forecasting is on a watershed basis. The techniques employed for this level of forecasting are referred to as "mesa-scale" forecasting and the probability of false alarms increases as the forecast area decreases. The use of real-time data proved extremely helpful in projecting peak flows, times and reservoir level increases. The events of 1987 will be used to improve decision aids and adjust hydrologic models to better reflect actual basin runoff responses. Critical rainfall depths, durations and intensities will be identified for various problem areas within the Lena Gulch basin. Tributaries to Lena Gulch produced some of the worst flooding in the upper basin and decision aids for their respective problem areas are needed. It should be noted that significant flooding problems can occur along tributaries without causing any major problems along the main stem as illustrated by the June 18 event. These scenarios need to be recognized so that appropriate emergency responses can occur. The 1987 experience called attention to the continual need for improved communications. The proper information must be communicated in a timely manner if the warning plan is expected to have any chance of succeeding. Dispatch operators are not well versed in the areas of meteorology and hydrology and care must be taken to make sure that the correct communication occurs and critical messages are not delayed. Training programs or periodic contacts are needed to help assure that individuals on duty will understand the importance of relaying weather related information to all emergency response groups within the specified communications network.